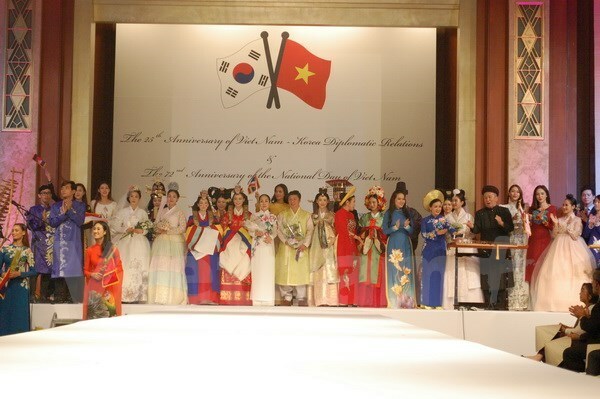 Seoul (VNA) – The Vietnamese Embassy in the Republic of Korea (RoK) on August 29 held a ceremony to mark the 72nd anniversary of National Day (September 2) and the 25th anniversary of diplomatic relations between the two countries. The event was attended by RoK Minister of Interior and Safety Kim Boo-kyum, RoK Deputy Minister of Foreign Affairs Cho Hyun, representatives from foreign embassies and international organisations in the host country, RoK-Vietnam friendship association, and Vietnamese people in the country. Speaking at the ceremony, Vietnamese Ambassador to the RoK Nguyen Vu Tu recalled the country’s historical milestones, including when President Ho Chi Minh read the Declaration of Independence at Ba Dinh Square 72 years ago, officially giving birth to the Socialist Republic of Vietnam. The seven-decade road has seen Vietnamese people’s efforts to protect national freedom and independence and promote national construction, he said. He expressed his delight that Vietnam has become a middle income country and experiences average annual economic growth of about 7 percent. The country has diplomatic ties with more than 170 nations worldwide and is a proactive member of many international organisations, Tu said, adding that Vietnam is hosting the Asia-Pacific Economic Cooperation (APEC) Summit 2017. Vietnam cherishes relations with the RoK, he said, stating that similarities in culture and history as well as economic support and efforts made by the two peoples have created a basis to bolster bilateral relations. The RoK is currently the largest foreign investor and second largest trade partner of Vietnam, Tu underlined, saying that some 150,000 Vietnamese people currently live and work in the East Asian nation and some 150,000 RoK nationals are in Vietnam. Lauding Vietnam’s achievements in the past seven decades, Deputy Minister of Foreign Affairs Cho Hyun mentioned success both sides have gained after establishing diplomatic relations, particularly the upgrade of bilateral relations to a strategic partnership in 2009. Besides political, diplomatic and economic activities, people-to-people exchanges between the two countries have been thriving as well, he added. He also mentioned the meeting between President Moon Jae-in and Prime Minister Nguyen Xuan Phuc in Hamburg, Germany in July on the sidelines of the G-20 Summit. He said that the RoK leader will attend the APEC Summit in Da Nang city in November. The RoK will make further efforts to promote relations between the two countries, he noted.